Black Lightning is not only DC comics’ first African American superhero, but Cress Williams will also be the first Black man to lead a network TV series. For comic book innovators like Milestone Media co-founder Denys Cowan and The Other Side Of The DC Universe writer John Ridley, this has been a long time coming. 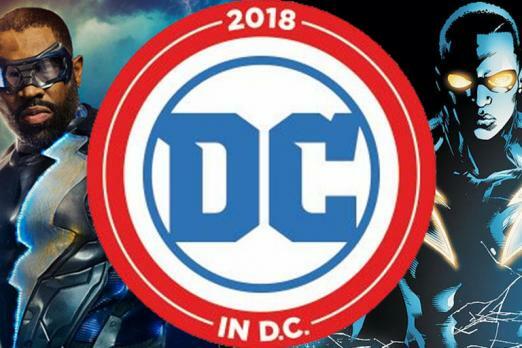 David Harewood shows off his Black Lightning shirt at DC In DC. Photo: Warner Bros.
Black Lightning, created by Tony Isabella and illustrated by Trevor Von Eeden in 1977, was one of the first times Ridley saw himself in a comic book. It later became Milestone’s goal, founded in 1993, to make sure everyone could see themselves in comic books. The influence of co-founder Dwayne McDuffie’s inclusive ideologies helped expand Milestone’s mission to its full capacity. Decades later, executive producers Salim and Mara Brock Akil continue to build on that same foundation with the Black Lightning TV series. 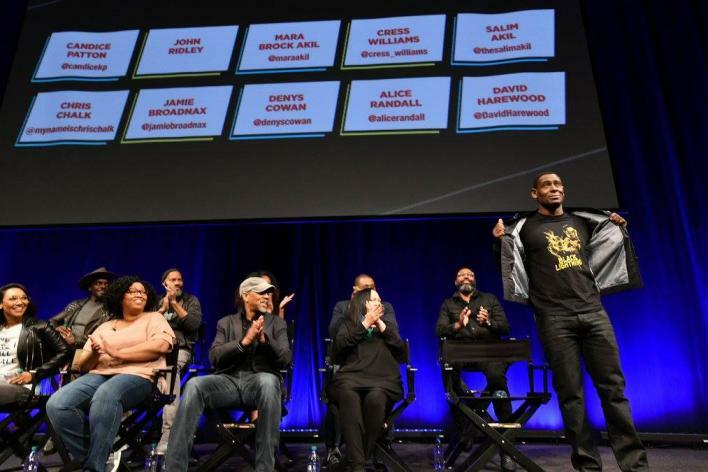 “These writers and producers are creating the text to make sure our reality is better in the future,” said The Wind Done Gone author Alice Randall, who is currently working with Reginald Hudlin on Earth-M, a title in Milestone’s upcoming line. The Akil's are adapting visceral, real-world experiences to Black Lightning and they aren’t holding back an ounce of emotion in the process. It’s clear from the the footage released so far that Black Lightning is different. Jefferson Pierce, a high school principal, would be a hero even if he didn’t have powers. At the end of the day, he’s just a man trying to survive and do the best he can in an unjust world. Black Lightning premieres on The CW Jan. 16 at 9 p.m.